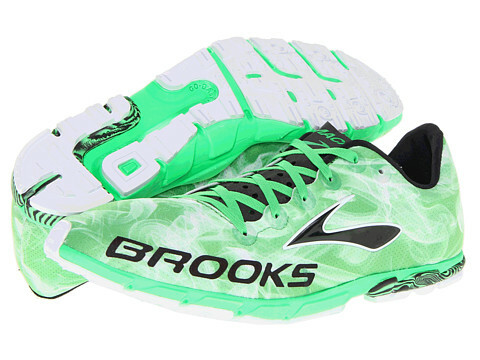 Early last year, I picked up a nifty little pair of spikeless cross-country flats, the Brooks Mach 13 Spikeless. They were a neat shoe...light, nimble, fun. Sure, they weren't very versatile, but whatever, they were cheap, so it's not like they had to be the only shoes in my closet. So I bought a bunch of them...enough that I completely missed out on the Mach 14 because I was too busy going through a pile of Speed Dragons. By the time I had exhausted my stash, Brooks had moved on to the Mach 14's successor, the Mach 15. Brooks' Mach 15 Spike is a cross country shoe engineered for 3k to 10k distances on asphalt, dirt, wood, or rubber surfaces. CMEVA is a full length compression molded EVA designed for lightweight cushioning and flexibility. Air Mesh covers the upper and is a breathable mesh that allows heat to escape. Microfiber and Synthetic Overlays are strategically located to provide a secure fit. Contact Rubber is a thin layer of full length rubber and has an aggressive lug configuration designed for traction. If you've worn the Mach 12, Mach 13, or Mach 14, you know what to expect with the Mach 15. The midsole and outsole remains unchanged, though the upper has been updated with a thin, seamless upper that uses a less mesh-y material than that seen in the Mach 12 and 13. The new upper is even more glove-like than the old upper, and begs to be worn sockless. It's slightly stretchier than the old upper and conforms to your foot with wear, though it's also a little less durable, and I tore through mine at about 270 miles (which still isn't bad for a spike). For some reason, I sweat a lot in it, and it doesn't breathe quite as well as the old upper, but it doesn't feel overly hot either. The Mach 15 uses asymmetrical lacing, which solves the weird compressing-on-extensor-tendons issue I used to have with the Mach 13, though it's also changed to ribbon laces that don't stay tied very well, so you may want to replace them (or at least loop them through one of the places the laces cross over your instep). The tongue has also been changed to a very light, thin, barely-there strip of fabric. Brooks Mach 15 Spikeless sole with mini-lugs. You can also see how it's built off of a curved last. As expected, you won't find much cushioning in the Mach 15. As a cross-country spike, there's a little more to the midsole than there is in most track spikes, but that's about it. Meant to be worn on grass, dirt, and other soft-surfaces, the Mach has a firm, low-slung ride and offers good ground-feel. Bear in mind though, while it is meant for soft surfaces, it's a cross-country spike, not a trail shoe with a rockplate, and probably isn't the best choice for technical trails. Additionally, it has mini-lugs and isn't a very good road flat out of the box. However, after 100-150 miles, the mini-lugs wear down and it actually ends up working pretty well on the road. That said, if you're looking for a road flat, I probably would recommend you buy an actual road racing flat, not a spikeless cross-country racer, since by the time its outsole is road-worthy, you're almost halfway through its lifespan. That said, for its given purpose (dirt and grass), it's a great shoe. Finally, since the midsole is thin and firm, the midsole has great durability and you'll tear through the upper before you wear out the midsole (every Mach I've thrown out has been retired due to a ripped upper, not a worn midsole). The spiked version has five spike receptacles, with three on the lateral medial forefoot and two on the lateral forefoot (directly across from the posteromedial two). While I generally favor a more staggered six-spike pattern (like that seen on the Nike Zoom Victory and Victory XC), or even a five-spike configuration with the fifth spike up near the toe (like that seen on the Brooks The Wire), traction still seems to be fine. Additionally, the flexibility of the Mach means it doesn't force you up onto your toes quite as much, so you don't need that last lateral spike to the same extent as you do with the more aggressive spikes. The Mach 15 is every bit as flexible as its predecessors, with plenty of forefoot and lateral flexibility. It's not an overly aggressive spike that puts you on your toes, though this does make it a little more relaxed and easier on your calves than some of the "faster-feeling" spikes. Because the shoe is so flexible and the upper is so unstructured, there's not really much in the way of support or inherent stability in the Mach 15. Furthermore, the heel counter is flexible (though it is slightly stiffer than the rest of the upper), so there's little to no support derived from that either. Generally speaking, spikes are worn by the young and fast for short races (there are exceptions, of course, but as I said, generally speaking), so like cushioning, stability is usually sacrificed for the sake of weight-savings, since those athletes aren't on the course for very long and recover as only teenagers and early 20-somethings do. That isn't to say these can't be used for distance though, and I've used them for plenty of 16+ mile speedworkouts, so use your judgement according to your previous shoe and running history. The Mach 15 has a performance fit and runs extremely narrow, though the upper does stretch a little bit with wear (once you hit 100 miles, it's pretty well conformed to your foot, but it does take a while). It also runs a little small and I have to size it a half-size up (sizing is the same as its predecessors). It is also built off of a curved last. In case you couldn't tell from the fact that I keep buying this shoe, I really like the Mach 15. It's not a versatile shoe, and it's probably a little narrow through the forefoot to be a good pick for most minimalists looking for a minimal shoe, but it's a solid pick for cross-country runners looking for a spike this fall but not wanting to break the budget with a pair of Victory XCs, and as a speedwork shoe that feels fast yet isn't so aggressive that it tears up my calves, it works well for me. Furthermore, while the Mach 15 is most at home on hardpacked dirt and grass, the spikeless version (or the spike with blanks) does work well on the road once the mini-lugs are worn down. The Brooks Mach 15 is available on Brooks' website, as well as many retailers that sell Brooks products. The Mach 15 retails for $75 and the spikeless version retails for $70. The Mach 15 runs small and narrow, so you may want to size up half a size, and if you have wide feet or prefer a roomy forefoot, definitely try it on before you buy. Full disclosure: I was a tester for the Mach 15, but I bought the shoes that are pictured, and the tested shoes are the final product, not a tester version. The opinions expressed in this review are mine and based on my experience, and do not reflect the opinions of Brooks or anyone else.